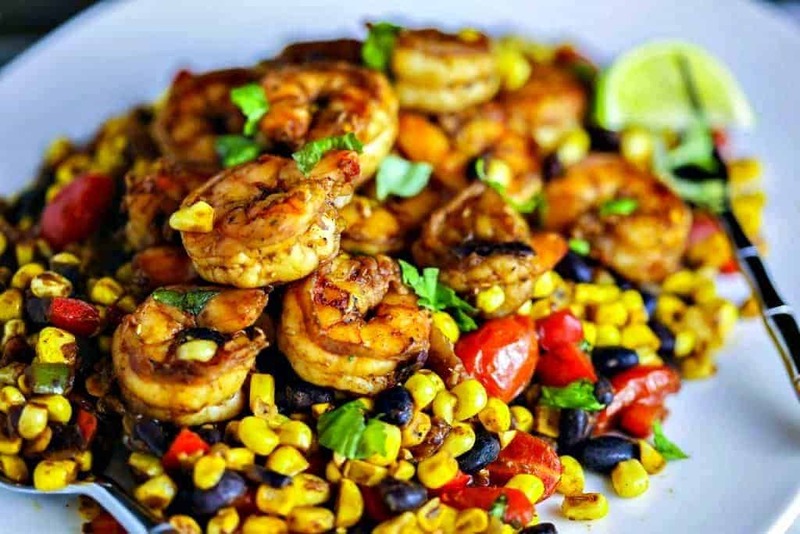 Southwest Shrimp and Succotash—a fresh and healthy TexMex twist on a Summer classic. One of my very favorite ways to enjoy fresh sweet corn during the summer is in succotash. Traditionally, succotash is made in the South by frying sweet corn with lima beans, onions, and tomatoes (and usually in bacon fat!). 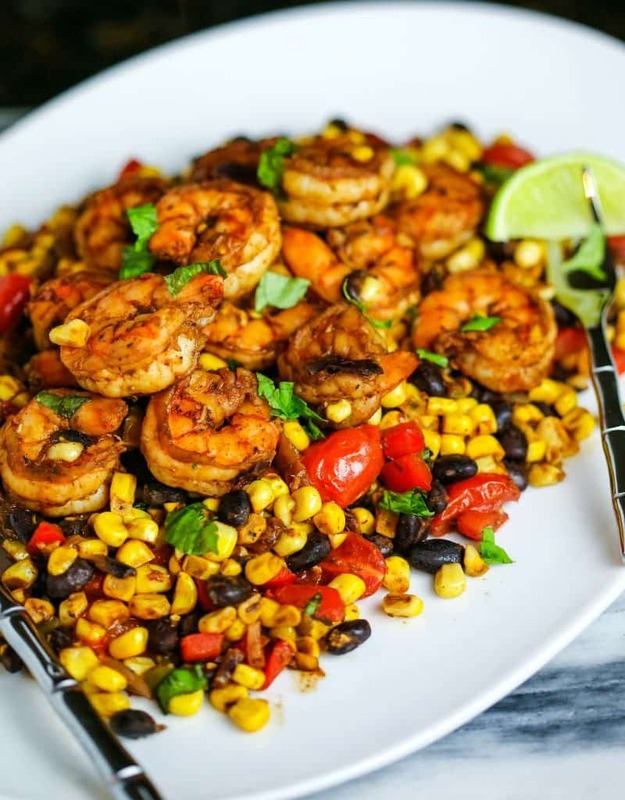 By substituting black beans for the lima beans and adding diced jalapeño and spice-rubbed shrimp, this dish turns into a lovely spiced-up, one-skillet meal. Start with a pound of large shrimp (peeled and deveined). Create your own spice rub with chili powder, coriander, cumin, and oregano—all stables in the pantry—and salt and pepper. If you like extra spicy, add a little red cayenne pepper to the rub. Pat the shrimp dry with paper towels, then sprinkle liberally with the rub mixture on all sides. The entire dish can be cooked and served in one large non-stick skillet—don’t you just love that?! 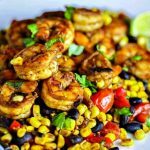 I like to use cast iron, but with this recipe you need to be careful that the cast iron doesn’t get too hot. First, the corn, onion, and red bell pepper cook for just 5 to 10 minutes in a bit of olive oil before adding the garlic, jalapeño pepper, and black beans. Next, add in the shrimp and cook and stir until the shrimp begins to turn pink underneath the spicy rub. The final step is to add the liquid and fresh basil (or cilantro, if you prefer). 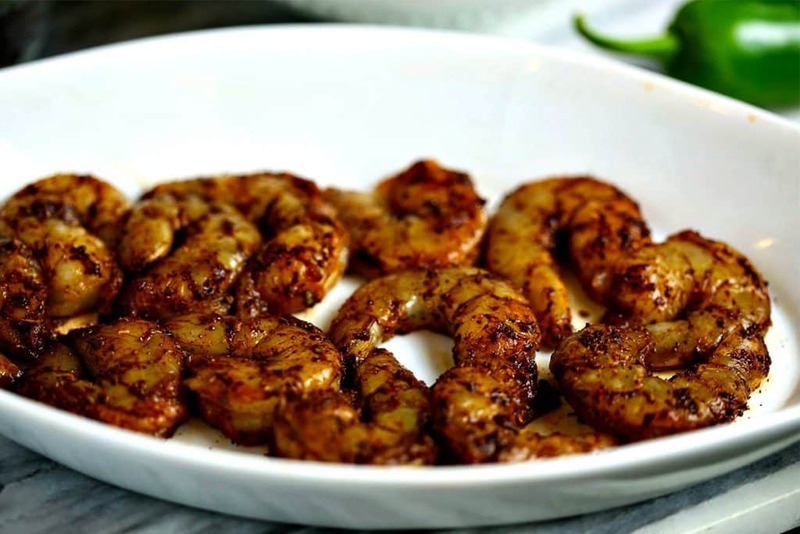 You’ll notice that the mixture will begin to thicken quickly from the spices on the shrimp, but adding in a bit of water and fresh lime juice makes the consistency just right. I like to serve this dish garnished with more fresh basil leaves and fresh lime wedges. In a small bowl, combine all rub ingredients. Peel and devein shrimp and pat dry with paper towels. sprinkle rub on all sides of the shrimp and set aside. Heat olive oil a large skillet over medium heat. Add the corn, onion, and bell pepper and cook for 5-10 minutes, stirring frequently, until vegetables are beginning to get soft. Add the garlic and jalapeño pepper and cook until fragrant, about a minute. Push veggies to one side of the pan and add the shrimp to the other side. Cook and stir until shrimp are pink, about 5 minutes. Add fresh basil and water and cook another minute. Squeeze lime juice over all, stir, and serve with more fresh basil and lime wedges, if desired.